Peroulades Logas Corfu: Peroulades is a narrow beach encircled by imposing hills. 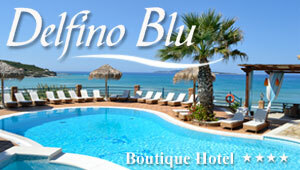 It is located 36 km northwest of Corfu town and it is considered as one of the most beautiful spots on the island. This beach is conspicuous by its perpendicular rocky cliffs which are rather difficult to reach, through a steep path. This beach is impeccably maintained and rather well organized. From the small sandy beach you can enjoy breathtaking sunset views. Taverns, bars and a nice choice of accommodation lie around the bay. Very impressive cliffs with the best sunset in Corfu. Above the beach, there is a nice bar. The only thing is that the shore is very narrow and to get there you have to walk on some slippery rocks, so you have to be very careful. When it gets windy (and it gets frequently), the waves are large and you just can't swim. In any case, the view is very nice.